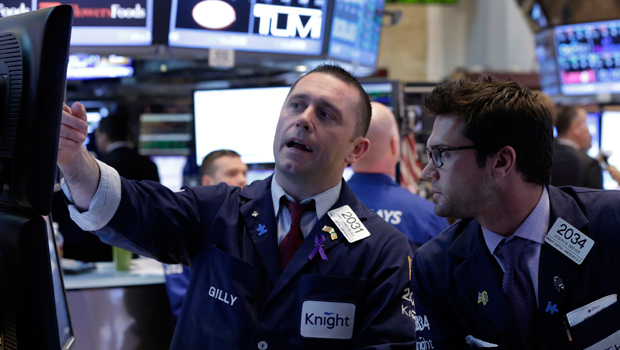 NEW YORK Stocks ended the week on a high, with investors seemingly at ease ahead of a Federal Reserve meeting next week that could see the central bank scale back massive monthly bond purchases aimed at boosting the economy. Investors were buoyed by two economic reports, one showing that inflation remained tame in August and the other showing Americans spent more. The Dow Jones industrial average enjoyed its second-best week of the year, closing at 15,376, up 75 points, or 0.5 percent. The Standard & Poor's 500 index rose five points, or 0.3 percent, to 1,688. The Nasdaq composite index ended the day up six points, or 0.1 percent, to 3,722. September has been very strong for stocks so far. The Dow is up 3.8 percent, and the S&P 500 has gained 3.4 percent. Twitter's stealth IPO: Less info for investors? The Dow got a lift from Intel. Analysts at Jefferies & Co. said Intel may be able to increase its sales with power-efficient chips. The sales report was a mixed bag. Shoppers spent more on cars, electronics and furniture, but they didn't buy much else. Last month, several retail chains including Nordstrom, Macy's and Wal-Mart cut their profit forecasts for the year. The government also reported that wholesale prices rose 0.3 percent last month. Over the past year, prices have only gained 1.4 percent, a sign that inflation remains modest. One thing driving wholesale prices higher was energy, which spiked as a conflict with Syria appeared likely. Trading was light as Wall Street headed into the weekend and the Jewish holiday of Yom Kippur starts at sundown. About 2.8 billion shares traded on the New York Stock Exchange by the early afternoon, versus the 6.5 billion traded on an average day. Investors waited for the Federal Reserve's policy meeting on Sept. 17-18, when the central bank is expected to decide the future of its bond-buying program. "There's a lot of 'wait and see' going on until the Fed meeting next week," said Frank Davis, director of sales and trading at LEK Securities. The Fed is buying $85 billion in bonds each month, and the consensus among investors is that the central bank will decide to reduce its buying to about $75 billion or $80 billion a month. The question is no longer whether the Fed will cut back on its bond buying but by how much, said Scott Clemons, chief investment strategist with Brown Brothers Harriman Wealth Management. Despite the run up in stocks this week, some market watchers think markets are heading for a fall. Ed Yardeni, president and chief investment strategist for institutional investor advisory Yardeni Research, noted that since late August the percentage of investors who expect a stock market correction has risen to 40 percent, up from less than 30 percent four weeks ago. Although retail sales rose in July, they were not as strong as expected. Spending at retail businesses rose 0.2 percent last month, the smallest gain in four months and below consensus forecasts of 0.5 percent.